I asked Marian to curate today’s photo, and to my surprise she picked this one. 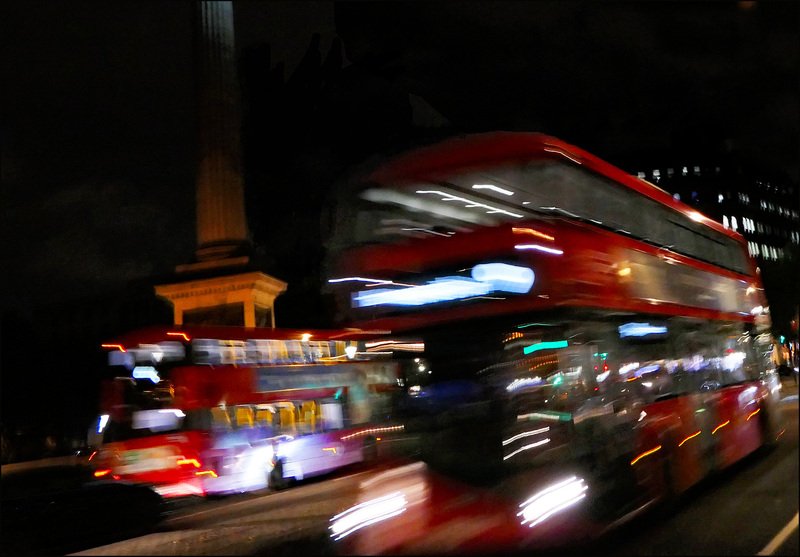 It is, obviously, a London bus passing Trafalgar Square. That’s Nelson’s column in the background. The bus itself is the #9 that formed our primary link between downtown and our home in Kensington. It’s worth saying that if you visit London and haven’t used the buses, you’re missing out. Not only can you see the city, especially from the upper deck, but the right bus can often get you closer to your destination than the tube. If nothing else, get to know two or three of the main bus routes that pass near your hotel or house. Or download an app like CityMapper that will figure out a bus route for you based on where you happen to be. Buses use the same Oyster card you use for the tube. Marian was a little bit skeptical at first, but she quickly became a great fan and took the bus everywhere. They’re mostly not very crowded, even at rush hour, and if you can snag the front upper seat, you get a great view.